We custom cut logos and letters from just about any material, including aluminum, stainless steel, brass, acrylic, PVC, and MDF. 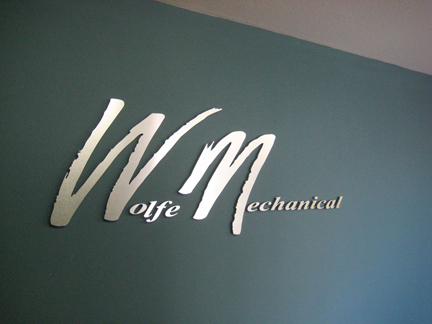 Metal logos and letters can be either brushed or polished, aluminum can be anodized for exterior use. Acrylic and MDF letters can be painted in any Pantone color. In many cases, installation is performed using pins so that letters and logo appear to be "floating" off the wall or background.